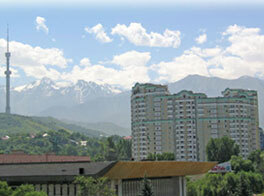 Internet reservation of Almaty Hotels on www.almatyhotels.ru! We provide guaranteed hotel reservation of hotels in Almaty. Review and book your accommodation in Almaty hotels directly over the internet. The Astana International hotel is the best solution for those who arrived in Almaty within the framework of a business trip.. The Kazzhol hotel is a fashionable hotel which is situated in the very center of Almaty and offers its guests only the high-class service.